So I have a new bed partner. One that my husband doesn’t actually mind me having. Remember when I said my back was in pain, but it wasn’t muscle pain? One day I couldn’t even lift my elbows up out to the side. I was worried about how I was going to teach my Thursday morning Nia class. Doing Nia and using the foam roller helped. So I did a post about using a foam roller to roll it out so I would remember to use it. Click HERE for that. It worked great. I had to roll it out or roll on the foam roller often, but it worked. Then I started thinking . . . “Why is my back bothering me in the first place?” I started paying attention. I noticed that after I slept in a specific position was when my back hurt. And that same position also hurt my shoulder. I think my hips were being effected by this position too! It is a cross between an on-your-side position and an on-your-stomach position. Where I kind fold my upper body in half. I came to the conclusion that I needed to stop folding in on myself. I thought if I slept more on my side with my upper body “open” instead of the half-side-half- stomach-fold it might help. So I am sleeping with my foam roller. 🙂 Yes, I know they make body pillows so that might work, but why get ANOTHER thing when I can use something I have? Plus I think a pillow might be soft enough to still allow me to fold more than I want, whereas the roller keeps me propped up. I don’t fold at all. So I slept with my foam roller for a few nights and my back pain stopped. So, now, I sleep on my side with my leg on the roller. The roller keeps my hips more in alignment. I say “more” because I don’t think they are IN alignment but more so than when I let my leg rest on the bed. And I have the roller down low enough so that the arm on the side I am lying on has a place to be and I actually use the roller (almost the “top” of it) to keep my body propped up. My “top” arm which rest on the roller doesn’t allow me to fold in on myself and rest my shoulder/arm on the bed. Honestly the roller is not all that comfortable and so the hardness of it would keep me awake at first. But not having my back hurt all day was worth it. Plus the first few nights I would actually wake up a bit to move the roller to the other side when I switched sides. Now . . . since my back feels better, if I want to turn over I have been leaving the roller only on one side. I think that not folding over on at least one side is helping. I am now using my foam roller as a preventative tool and not just a restorative tool. Nice. How do you sleep? Do you have a lot of pillows? Do you have a body pillow? Do you wake up sometimes with a crick? Do you wake up with pains in your shoulder(s)/hip(s)? If you have read almost any of my posts you have heard me say that I use my blog as a recipe book and my reminder for things. So today I am writing myself a post about the foam roller. I know I have talked before about using tennis balls to roll out a muscle issue in my back. I actually used a different type of ball – like a huge super ball – because I don’t have any tennis balls, but it helped a lot. This time it was not a muscle issue. And I am not necessarily recommending this as something you should do. I was a little nervous doing it myself, but I really was getting to the point where I couldn’t tolerate the pain any longer. I couldn’t move my head. Driving to teach my Nia class this morning I was doing the full torso twist as I changed lanes . . . I had to lift away from the seat and turn my whole torso because I could not comfortably turn my head. So I used my foam roller to roll out my back. I believe sometimes stress is held in the body. I think that there is a little stress going on right now. Ya think? And I believe I am holding my stress of late in my back. Normally, as I somewhat alluded too above, I might have stress held in the muscles, but this time it was more in my spine. I am more brave when it comes to muscles or connective tissue issues, but a little leery of trying to adjust my spine, but as I said, it was needed. So I laid down on the foam roller so that I could roll it down the length of my spine. Now I want you to know that if you have back pain you should see a professional. A professional as in a doctor, a chiropractor, an osteopathic physician , etc. Someone that can treat you and your back. If you are familiar with your back issues and you feel comfortable doing this, that is up to you. So I used it on my back as I did on my hamstrings in my post Roll Out The Hamstring. But on my back I gingerly rolled on the roller. I started about mid-back,then rolled up, then down. I used my arms to support my weight a bit. Ahhhh, it was fantastic. I moved freely the rest of the day, which was great because I had a Gentle Yoga class to teach tonight. 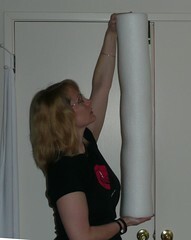 I also did the vertical stretch shown in my first post about foam rollers, Foam Rollers are COOL! Well, this might be something that might help you, again, I caution you. But I know it will help me, but now I just have to remember and that is why I am posting it. I definitely need a reminder for something occurring during this period of time. Have you ever used a foam roller? What do you use them for? Do they help with massaging your muscles? Vertical Means Stand It On Its End, Right? I had to cancel a Nia class recently. Not permanently cancel, just one Saturday class. If you know me, you know it had to be serious. While I was away I wrote the “More Foam Roller Coolness” post. A couple of days later a few things occurred to me. The first thing that occurred to me was that the progression of exercise difficulty could be totally different for everyone — depending upon where they were physically. Of course you know that but I always feel it is important to state it. I was thinking that horizontal to vertical was the more difficult progression because it was difficult for me at that time (my ankle has been getting my attention recently). But for others, maybe even most others, it would be the other way, from vertical to horizontal. Another thing I thought about that made me chuckle was the term horizontal and vertical. I didn’t describe that at all. I guess that is what I get when I am out of town because of some medical situation for my mom. I had other things on my mind and wasn’t thinking too clearly and so I didn’t think to clarify. And it did not help that my dad kept popping in the room telling me about more information he found on the internet about some of the medical procedures. Sometimes having the internet at your disposal to see medical procedures is not really all that great! So this post is to correct or remind readers that the horizontal to vertical progression, might actually be vertical to horizontal – depending upon the situation – and to explain what “horizontal” and “vertical” is. If you were to stand with both of your feet facing front and you placed the roller on the ground so that each end was on the opposite side of your feet that is an example of the “horizontal” position. To clarify when using the roller in the horizontal position you could place it wherever it is required to be for what you are doing as long as the roller is more or less positioned with the length going from left to right (or right to left). If you were to stand with both of your feet facing front and you placed the roller on the ground so that the length of it went along the side of your foot, that would be the “vertical” position of the foam roller. For a moment I had pictured people imagining setting the roller on its end and trying to figure out how to do exercises from there. That is what had me chuckling. So no, in this case, “vertical” does not mean stand it on its end! 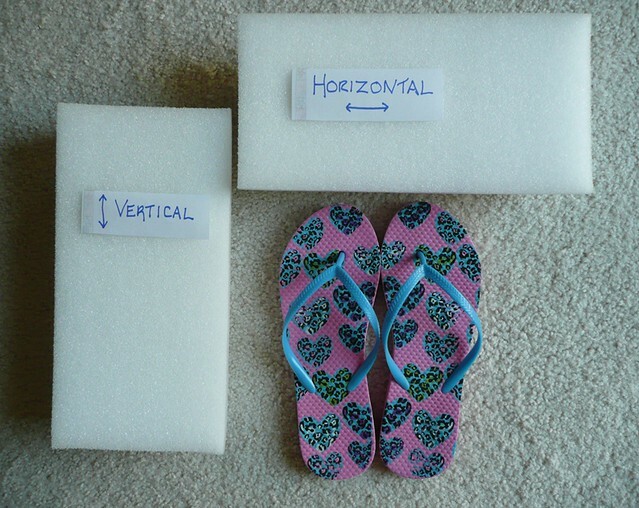 Again, where you place the roller as you are going to use it depends on what exercise or stretch you are going to do, but the “horizontal” means from left to right (or right to left) and “vertical” means if you were to stand near it is would be parallel to your foot. It would also be called “vertical” when you place the foam roller on the ground and are going to lie on it with one end at your head and the other end at your tail. Does it all make better sense now? Do you understand you don’t have to be a Cirque du Soleil acrobat to do stretches or exercise with the foam roller in a “vertical” position? Foam rollers really are cool, as I stated in my first post about them. In my first post I talked about how great they are to help you stretch. In my last post I mentioned that the foam roller can be used to do exercises. I mentioned that exercises can be progressed by using different surfaces and that the different sides of the halved rollers can be used too. Most exercises with the foam roller have to do with balance. A standard exercise can be done with the a foam roller requiring greater stabilization in the core. 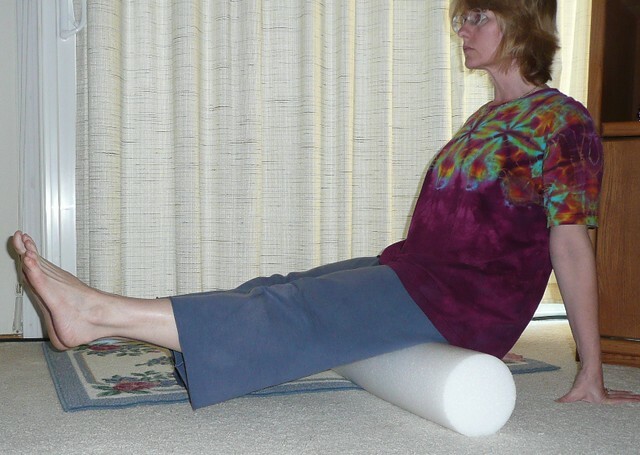 A stable core assists with balance, so using a roller adds the challenge of having to balance while doing the exercise. One standard exercise you can do with the addition of a foam roller is a squat. One foot would be placed on a halved roller. Starting off with the roller placed horizontal would be an easier exercise than with the roller placed vertical. The vertical position would be the one that would offer the greatest challange to your balance. As mentioned in the last post you can use either sided of the halved roller, standing on the rounded side or standing on the flat side. With the rounded side on the ground the surface the roller is on makes a difference. A mat or a carpeted surface would supply more friction and allow the roller a better grip. A smooth surface would add a greater challange. A squat ending in a one-legged stance on the roller would be another exercise. The roller position for this exercise would be horizontal with the flat side on the ground. You would do the squat and come up to standing on one leg, the leg on the roller. One of my favorite balance/stabilization exercises is to lie on the full rounded foam roller, just as if you were going to do the stretch I wrote about in my first post. Lie with the roller along your spine from head to tail. Lift your feet off the ground so that your lower legs are parrallel to the ground and your thighs are perpendicular, in Pilates the position is called table top. The goal is to lift your arms off the ground so none of your limbs are in contact with the ground. It might take a few trys. You can use your arms to try to gain your balance. Balance on the roller. Balance as long as you can. A great exercise for the glutes and hamstrings is the bridge. A bridge can be done with your feet on the ground but adding the roller gives it that extra added intensity. A bridge is where you lie with your back on the ground and press your hips to the sky squeezing your glutes and the back of your legs. Using the full round roller put both your feet on it. The height of the roller makes the move more intense and having to keep the roller stable and not allow it to roll make the squeeze even MORE intense. Give it a try. These exercises can be done by anyone wanting to gain, improve, or just play with their balance. These are just a few exercises you can do with a foam roller. Do you have a foam roller? Did you try these exercises with it? I bought a foam roller from my Pilates instructor awhile ago. The foam roller is reminiscent of a pool noodle, and is pretty darn versatile. It is wider than a pool noodle, usually 6 inches in diameter and I am going to say denser than a pool noodle. I bought it for one particular stretch, the one where you just lay on it. Both your head and your tush are on the roller and you are laying on it length-wise and your arms are stretched out with your elbows on the ground. I like that stretch. While keeping your elbows on the ground you draw your elbows towards your body or you can move your arms closer to your body by moving your hands down. Then you can stretch your arms up over your head. Just move your arms into whatever feels like a good stretch and feel the yummy goodness of using the roller. Since owning it I have done a few other stretches, some that my instructor had shown me and others I have figured out that if you can do it on a ball you can do it on a roller. But I recently took a class from the aforementioned instructor and learned even more. Like this other great stretch that is soooooo simple. Put a hand at each end of the foam roller. Hold the roller so it is vertical, then with your bottom hand press up into your other hand. Your top hand can even just hold on with your fingers if you want a really good stretch. This stretches out your shoulders. These are just two really simply stretches that you can do on a foam roller. As I continue to “blog”, I will share more. What stretches do you do on your foam roller? I would love to hear.